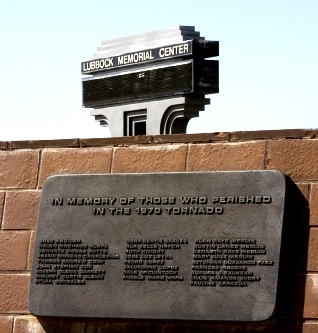 The 1970 Lubbock Tornado claimed the lives of twenty-six people. Men, women, and children, ranging in age from nine months to eighty-eight years, perished in their homes and vehicles during their desperate attempts to seek shelter from the raging storm. Like the rest of the devastation caused by the tornado, the total cost in human life was not fully realized until the days after the twister passed through Lubbock on the night of May 11, 1970. Aguilar, age 75, died May 11. He was found in the driveway of his son’s home at 221 North Avenue M, which was destroyed by the tornado. Alafa, age 30, was struck by flying debris while trying to find shelter on 4th Street. She died May 21 at West Texas Hospital. Butts, 56, died May 11 in her home at 1902 10th St., which was destroyed by the tornado. Canales, 33, a truck driver from Uvalde, Texas, died May 11 with companion Thomas Andrew Cook in their destroyed truck near Loop 289 and U.S. 87. Cook, 29, a truck driver from Uvalde, Texas, died May 11 with companion Frank Moreno Canales, Jr. in their destroyed truck near Loop 289 and U.S. 87. Cox, 26 and a Vietnam veteran, was injured after he and his wife took refuge outside their car on Clovis Highway near Avenue Q. He died at Methodist Hospital soon after the tornado. Garrett, 29, was badly injured when the tornado destroyed his family’s home at 1102 Marlboro Street. He died May 16 at Methodist Hospital. Glenn, 52, of Idalou, Texas, died at Methodist Hospital soon after the tornado. Gonzales, 46, died May 11 in her home at 201 North Avenue L, which was destroyed by the tornado. Graves, 49, died May 11 when she and her husband, H. J., were thrown from their car on Loop 289 near U.S. 87. Hatch, 77, was found in her destroyed home at 2101 Cypress Road. She died May 13 at Reese Air Force Base Hospital. Knight, 63, died May 11 in her home at 2201 Mesa Road, which was destroyed by the tornado. Leyva, 13, was the son of a migrant farm worker traveling to Nebraska. The powerful storm pulled the boy and his father from a car parked at the intersection of Erskine and U.S. 87. He sustained serious injuries from flying debris and died May 16 at Methodist Hospital. Lopez, 56, died May 11. He was found at the corner of 1st Street and Avenue M.
Lopez, 57, died May 11 in his home at 208 North Avenue L, which was destroyed by the tornado. McClintock, 39, died May 11 near a storm cellar at 2121 Cypress Road. He died trying to open the cellar door for his family. Medlin, 3, died May 11 with his parents in their home at 2301 Mesa Road. Medlin, 9 months, was found wrapped in a blanket at his destroyed home at 2301 Mesa Road. He died May 12 at Methodist Hospital. Medlin, 23, died May 11 in his home at 2301 Mesa Road, which was destroyed by the tornado. Medlin, 22, died May 11 in her home at 2301 Mesa Road, which was destroyed by the tornado. Mora, 9, was found with her mother and sisters in their destroyed home at 1311 Jarvis Street. She died May 19 at Methodist Hospital. Paez was trying to make her way to shelter when she was crushed by a falling truck near a home at 201 North Avenue O.
Rogers, 88, and her daughter, Cassie, were thrown from her home at 2105 Cypress Road. She was found wrapped in a piece of tin near the destroyed house. Her daughter recovered but the elderly Rogers died May 20 at Methodist Hospital. Salazar, 68, took shelter with another family in a home at 108 North Avenue L. She was struck by flying debris inside the home and died May 12 at Methodist Hospital. Short, 72, died May 11 when she was struck by debris from her home at 512 East Stanford. Zarazua, 39, died May 11 on Loop 289 near U.S. 87 while driving home from work. 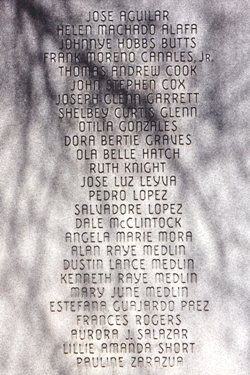 The names of the twenty-six victims are memorialized on two plaques in downtown Lubbock. 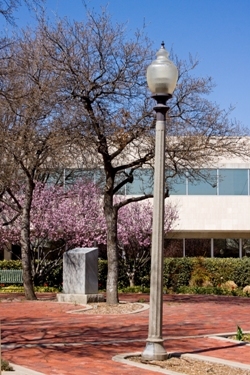 please contact the Planning Department at 806-775-2162 or email Sarah Hensley at shensley@mylubbock.us.